Traditionally, teachers have always determined the pace and format of all their lessons. What if we shake things up a bit in our classrooms and give students more control over how they learned instead? What if we put students in the driver’s seat of learning, let them design their own lessons and allow them to be teachers for the day? Relinquishing control of one’s classroom may seem a bit scary or chaotic, but it doesn’t have to be that way if we provide the guidance and structure students need. Below are the steps I took to ensure my students were designing meaningful lessons for their peers. I allowed students the option of working alone or in groups of their own choosing. Narrow down the standards, skills, or content that the lesson must address. This helps students determine the focus of their lesson. For example, in my language arts class, all groups were challenged with teaching a chapter of a novel we were reading. Each lesson must address a literary element present in the chapter, and students were to choose from this list: characterization, conflict, theme, figurative language (symbolism, metaphor, simile, or hyperbole), setting or mood. Students had to design the instructional material for their lesson. They could create handouts or use presentation software like Google Slides to fulfill this requirement. I asked my students these questions: What will your peers do to show that they have learned the content you taught? How will you evaluate each student individually and collect data on their learning? I really enjoyed the different approaches my students took to create their assessments. Many used Kahoot, a web-based gaming platform that tapped into their peers’ competitive spirits as they tried to best each other. Using this digital tool, lesson designers developed their own questions and determined the answers. Kahoot will reward players with points based on two criteria: the correct answer and student response time. Other lesson designers had students write their responses on Google Slides, Google Forms, or Google Docs. Some students opted for a non-digital route and passed out handouts or had classmates answer questions on a sheet of paper. I let my students determine the method they preferred. Before teaching their lesson, I met with each group to make sure their lessons were meaningful. I also checked for errors and questioned them on their workflow. For example, one group created a template in Google Docs for their assessment. Their plan was to have each student make a copy of the template, but they didn’t think about how they were going to collect these individual copies. I suggested they use a Google Form to collect the links to the individual files. I also pointed out that if the assignment asked students to write a short response, then using Google Form where all the answers would be populated into one spreadsheet is more efficient than collecting over 35 individual files. To ensure that all lessons were focused and productive, each group had to teach a concept or skill and give an assessment in approximately 15 minutes. This helps keep the lessons interesting and the students engaged. The peer teachers were addressed as “Mr.” or “Ms.” which everyone found extremely amusing. During the lesson, students also enjoyed having command of the classroom and would gleefully direct peers who were off-task to pay attention. After all lessons were taught, each group met to assess the data they collected from their peers. They had to determine a method for assigning grades, and I loved the discussions that arose over how to do this fairly. 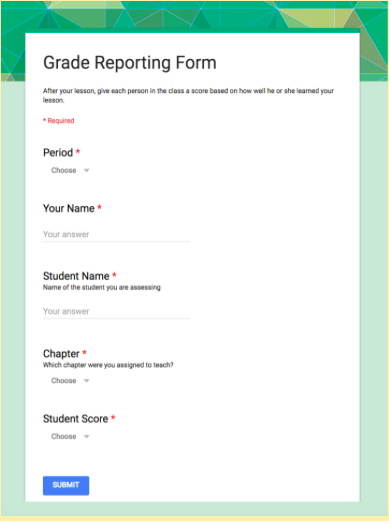 Each group would report a score for each student in the class. Then, I averaged the scores each person received from all the lessons that were taught and used that as a participation grade. What skills did you teach your peers? How effective was your lesson? How do you know? What can you do to improve your lesson? The responses to this project were overwhelmingly positive. My students truly enjoyed this activity, and countless students commented on how challenging it was to be a great teacher. One of my favorite responses came from a student who wrote, “I learned that it is not easy to be a teacher. 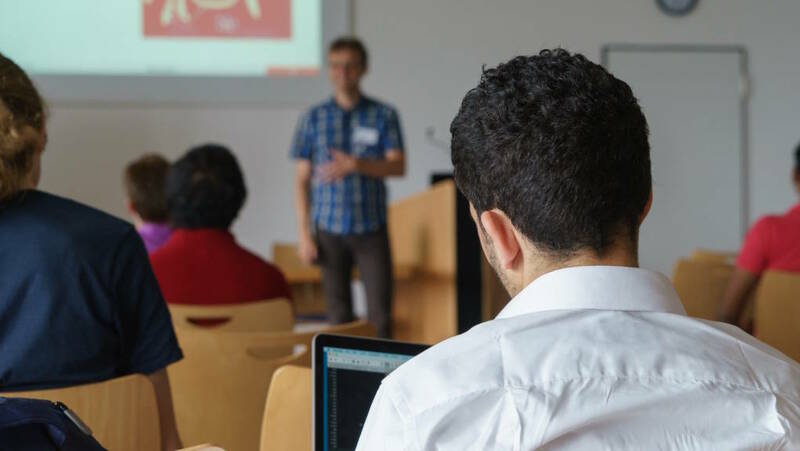 It takes time and dedication to actually learn to teach properly.” Also, quite a few came to the conclusion that “being a lesson designer and presenter is harder than it looks.” Many also shared that creating a lesson forced them to learn the material better because they were responsible for becoming experts on their chapter. By giving students voice and choice, we are cultivating our students’ investment in their own learning. This project also fosters many college and career-ready skills such as decision-making, project management, analysis, collaboration, communication and metacognition. Not only did I enjoy seeing my students bring new energy into our classroom environment, but they had a blast, too. Let’s empower students by giving them more control over their own learning in the classroom. The end result might surprise you as much as it did me. Challenging students to teach their own lessons! What a brilliant idea! If the kids are actively involved in their own education, and they are given responsibility over their peers’ education, I definitely think the majority of them will step to the plate. I’m bookmarking this page so that I can come back to this next year when I have my own classroom. It may be tough for a beginning teacher to enact, but I could definitely see myself using this somewhere down the line. Thank you!